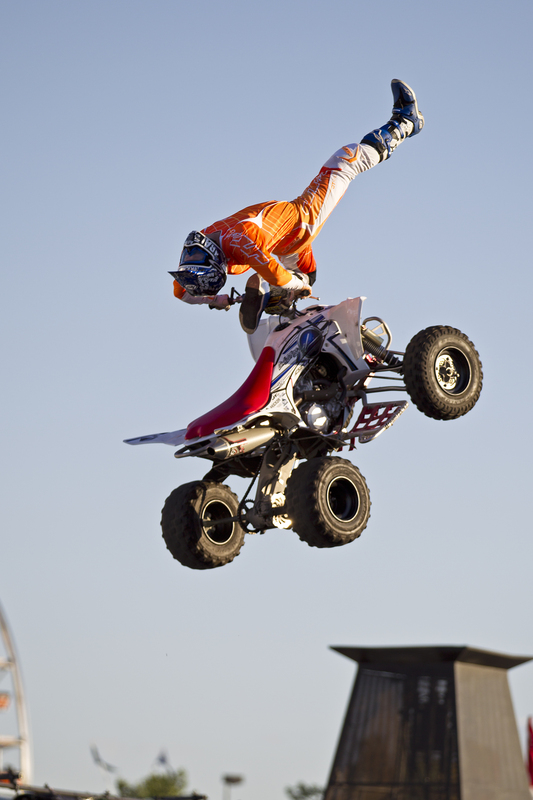 St. Petersburg, Fla. (Nov. 16, 2015) – Freestyle Quad champion Cody Elkins, who holds the Guinness World Record for the longest moving jump on a quad bike, has been added to the lineup of top-ranked athletes competing at the inaugural St. Pete Action Sports, Dec. 4 and 5 at Al Lang Stadium. The exciting, all-star event includes elite-level pro competitions in skateboarding, BMX Big Air Triples and Freestyle Motocross (FMX). Considered one of the world’s best quad riders, Elkins performs flips and tricks on the same ramps as the FMX pros. This will be the first time ever that a quad rider will compete against freestyle motocross riders in a competition. More than 40 superstars of action sports are competing at St. Pete Action Sports in an epic battle for ramp supremacy. The superstars of skateboarding competing include 23-time X Games medalist Andy Macdonald, 9-time X Games Gold Medalist Pierre-Luc Gagnon, Jimmy Wilkins, Mitchie Brusco, Sandro Dias and many others. Among the BMX pros competing: Ryan Nyquist, the second-most decorated BMX athlete in X Games history (with 16 career medals), Colton Satterfield (who recently made history by becoming the first BMX’er to nail a double flair on the Big Air ramp at the Austin X Games), James Foster of Nitro Circus fame and BMX stars like Scotty Cranmer, Morgan Wade and Nicholi Rogatkin. Along with Cody Elkins, the field of FMX daredevils revving up the intensity includes 5-time X Games medalist and 2-time World Champion, Taka Higashino, as well as FMX legends Adam Jones, Mike Mason, Todd Potter, Brody Wilson and others. Their backflips and whips will leave spectators on the edge of their seats. Among the intense competitions are Big Air Triples, which features BMX riders doing three consecutive jumps on a 200-foot-long by 32-foot-high ramp, skateboarding on the actual half-pipe from the X Games and a head-to-head FMX contest on ramps designed by Keith Sayers. From Bill Edwards Presents and ASA Entertainment, this exciting two-day clash of the titans will be like nothing the Tampa Bay area has seen before. Tickets are available at stpeteactionsports.com. Single day tickets: General Admission $30; Child (ages 3-12) $20; VIP $75 (includes a special seating area in front of the ramps for each competition); Platinum: $125 (includes special seating area, 4:30 p.m. entry into the venue for viewing of practice rounds, and a private athlete meet-and-greet). Two-day tickets: General Admission $50; Child (ages 3-12) $40: VIP $140 (includes a special seating area in front of the ramps for each competition); Platinum $235 (includes special seating area, 4:30 p.m. entry into the venue for viewing of practice rounds, and two athlete meet-and-greets). General admission student tickets (with valid student ID) are $20. A premier live entertainment company, Bill Edwards Presents Inc. has been producing world-class attractions for more than a decade. The company has established itself through producing shows and events in a variety of venues – including festivals, theaters, casinos-resorts, performing arts centers and arenas. Known for its reputation of aligning with award winning talent, Bill Edwards Presents is based in St. Petersburg, Florida. See www.billedwardspresents.com. Located in downtown St. Petersburg, Fla., the historic, waterfront Al Lang Stadium has been a vital part of the community since it was built in 1947. Originally a baseball park, the venue is named in honor of Al Lang, a former mayor of St. Petersburg who was instrumental in bringing professional baseball to the city in the early twentieth century. Owned by the City of St. Petersburg and now managed by Big3 Entertainment, LLC, today’s Al Lang Stadium is home to the North American Soccer League’s Tampa Bay Rowdies. In 2015, the venue underwent a major renovation including upgraded seating, improved concessions and concourse area, enhanced locker rooms and a state-of-the-art video scoreboard. This entry was posted in Front Page, News, SPX News by Taylor Dressler. Bookmark the permalink.